Childhood head injuries differ from adult head injuries in some significant respects. They occur against a background of ongoing physical and cognitive development. Cognitive capacities often change with time post-injury. But for children changes are affected by two processes of functional plasticity, one concerned with recovery, one with development. The impact of the injury is moderated by age/developmental stage. In recent years there has been a new focus on the longitudinal comparison of children post-injury with appropriate control groups. 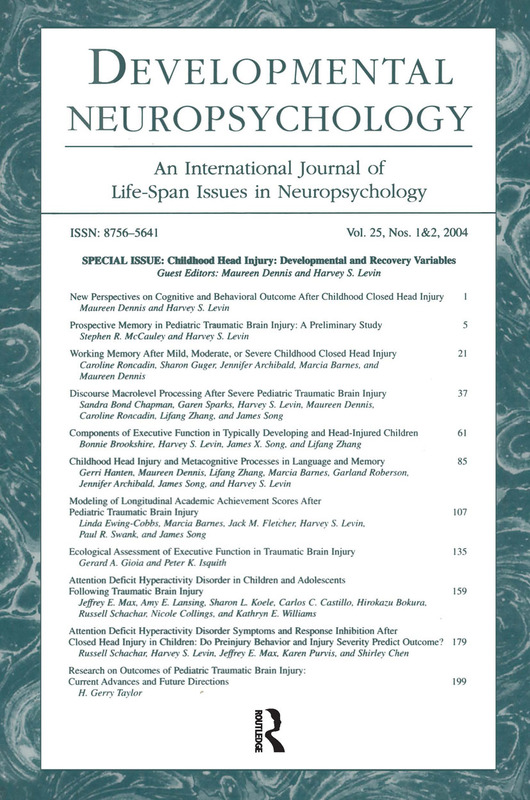 Advances in neuropsychological assessment have permitted evaluation with reference to more developmentally suitable norms; expanded definitions of outcome have broadened our understanding of consequences; and neuroimaging techniques have enabled the more precise delineation of injury severity, the study of structure-function outcome relations, and the investigation of reorganization of function. This special issue offers an overview of cutting-edge approaches to the analysis of childhood head injury. of processing rating, to charac-of the summary productions. of words recalled in each of the learning trials among the groups.